Laguna Park residents will be pocketing about $2.2 million each from the successful sale of the property, which will be put up for tender on May 24. With a plot ratio of 2.8, Laguna Park's price works out to $975psf ppr. The 528-unit, 677,493sqft property is making a second collective sale attempt with Knight Frank as its sole marketing agent. 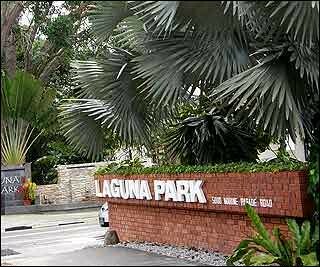 Knight Frank said the 33-year-old Laguna Park possesses many quality traits - it is the only available landsite along Marine Parade with a seafront view and it sits on a rectangular-shaped plot. But the winning buyer would be tasked with a potential 1,580 units for the redeveloped site, said Mr Tan Tiong Cheng, chairman of the Knight Frank marketing team handling Laguna Park's sale. He maintains that with a rectangle-shaped plot, a consortium of developers could split the land up and sell the units in phases. The firm is currently marketing the project to large property developers as well as a number of foreign ones. Knight Frank has also highlighted Pine Grove as one of the key competitors to Laguna Park. On top of Pine Grove, the marketing agent pointed out the large supply of government land and other key en bloc projects as competition. Meanwhile, the overall sentiment among residents of Laguna Park is one of confidence. "Residents are more positive about the sale this time around because property market is more robust and developers are building up their land bank now. The previous time it was put on sale was about 2009, when the property market sunk due to the Lehman Brothers crisis," said a resident who declined to be named. 4 comments to ''And the en bloc wheels keep on turning: Laguna Park"
$975psf ppr include DP and DC? Yes, it does look that way ($975psf ppr including DP & DC). What's the latest on Laguna Park? Anybody? any updates on laguna park? no news?